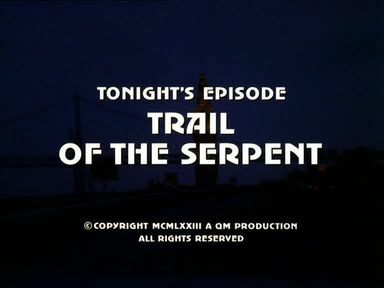 I have uploaded the screencaps for Trail of the Serpent to the episodes' page. An upcoming gang of street-hardened youths, known as the 'Cobras', is spreading fear and terror in the Potrero Hill district. Following a failed robbery of a small grocery store and after shooting down a police officer, the gang is taking Mike Stone hostage in exchange for its wounded leader who was captured in the bungled robbery. Keller teams up with Lt. Roy Devitt, scouring the underside of Potrero Hill in an effort to identify the location of the gang's hide-out and in search for their colleague and friend. However, due to a Governors' meeting held in the city, the police force's numbers are limited. Stone needs to try some fast talking and to relate with one of the gang members as some hardliners seem to be ready for anything. This episode is almost completely covering the eastern part of Potrero Hill. After leaving the former New Potrero Theatre, the gang shows up at local grocery store at 20th and Connecticut Streets. Following the failed robbery, the gang members are hiding in a condemned brickstone factory building house-numbered '650'; I initially thought it was demolished since then, but it is still there at 650 7th Street (however, the upper construction has been removed). We are also taken to a billiard bar at the junction of Mariposa and Mississippi Streets as well as to the famous curved part of Vermont Street. Police is busting suspects in the (formerly industrial) South Beach area, and the SF General Hospital was used for an indoor sequence. In the epilogue, Mike and Steve go and see Davey for whom Mike got a job in a China Town grocery store at Clay and Grant.